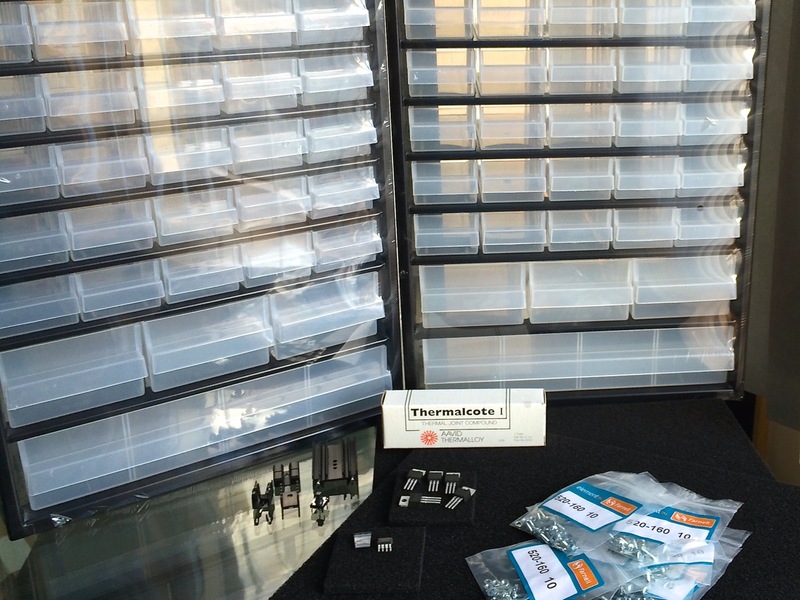 Farnell element14, also known as Newark or just ‘element14’ in other parts of the world, is great for sourcing large quantities of components at decent discounts, but I didn’t expect to get a good deal on buying only 1 or 2 items. The cabinet I found had such a low price, especially compared to the other, more expensive, yet smaller models, that it was too good to pass up. Perhaps it’s just a clever way to lure me in, hoping I’ll stick around and buy my other parts there as well. If that was the plan, they succeeded, because I also grabbed some bits and pieces I’ve been meaning to get for a while. The price charged for two of these cabinets does change a lot depending on which of the element14 stores you buy them from, and the currency you’re paying in. I bought two for €19.90 each ($24.80) on the Dutch version of the Farnell site. They charge £17.93 ($28.18) to UK customers, while Newark in the US wants $37.55 each. Perhaps the UK and US prices include sales tax/VAT, although a 51% increase seems too high to make sense. After I noticed the price increase for the cabinets, I compared the other Farnell/Newark prices as well and found similar differences (check the bottom of this post for a complete list). If Farnell can offer some of these items at a much lower price, it might be a good idea to shop around a bit before paying three times as much for a tube of thermal grease, or seven times as much for some nuts and bolts. The black lacquered steel cabinets come with 44 plastic drawers of various sizes. The cabinet construction seems sturdy and well-made, with a smooth finish, except for some rough edges on the sides where the top and bottom metal sheets are folded over. The drawers are kept from falling out of the open back by a metal strip along the top of each row. Lengthwise folded-up protrusions prevent them from sliding around when their neighbors are missing. 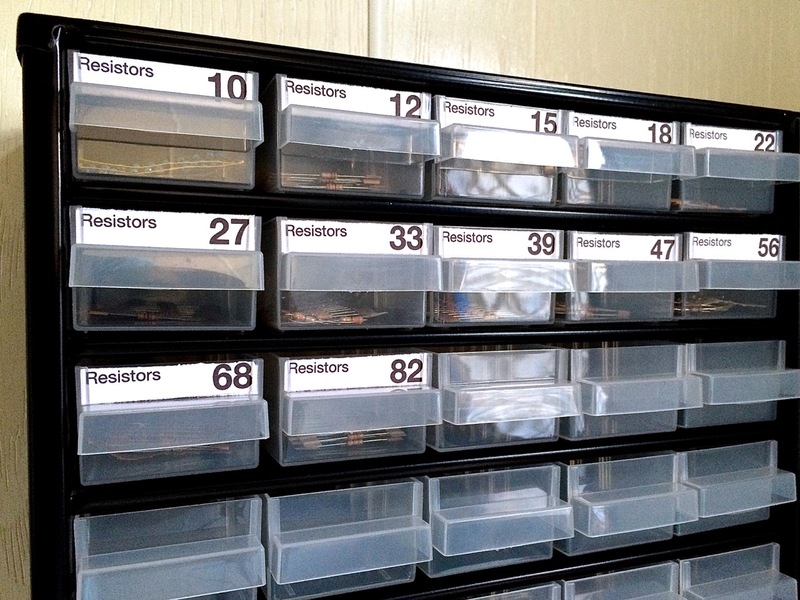 There are plenty of ESD-safe cabinets available if you’re willing to spend a lot more. I didn’t feel it was necessary to go that far. But just to add a bit of protection, I bought a few sheets of high-density conductive foam, to line the drawers of some of the more sensitive components. I’m not sure how much good it will actually do, but if nothing else, it should at least keep all the leads straight, and the drawers tidy. At this price, you shouldn’t expect the highest quality drawers. I was tempted to spend a bit more just to get that perfect, fully transparent hard plastic, but luckily I succumbed to reason and logic. As long as they do what they’re made for – store parts without falling apart – these are perfectly adequate. The drawers may not look that pretty, but they do come with plenty of useful features. Their slightly taller backsides will catch on the front of the cabinet, so accidentally sliding them out too far won’t spill their contents all over your workbench. 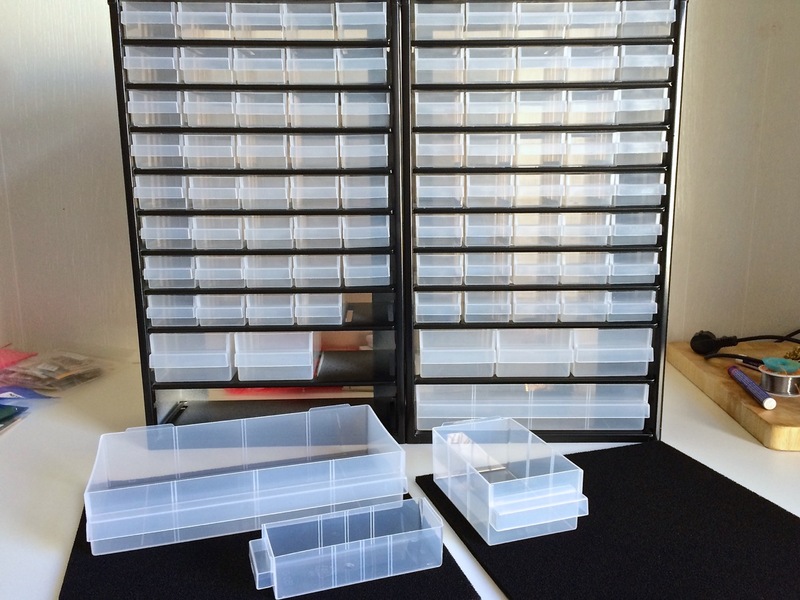 All three drawer types can be subdivided into sections of various sizes, either by buying a pack of dividers, or making your own. They also have convenient notches for labels, which again you can buy, or make yourself with some thick paper. 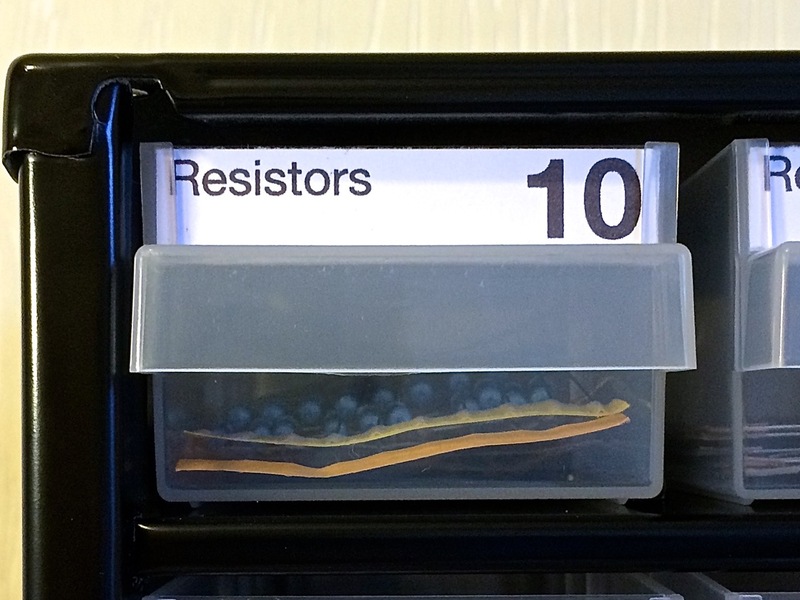 I already started on sorting my resistors with labels based on the E12 series, combining all resistor values starting with the same two numbers in the same drawer. I’ve been thinking about making my own power supply for a while. It’s one of those projects everyone starts working on at some point. It’s a lot more satisfying to build my own than to buy one off the shelf, especially with my current, limited needs (pun intended). I find it hard to choose what kind of supply to build first. Start off simple with a plain old 7805? 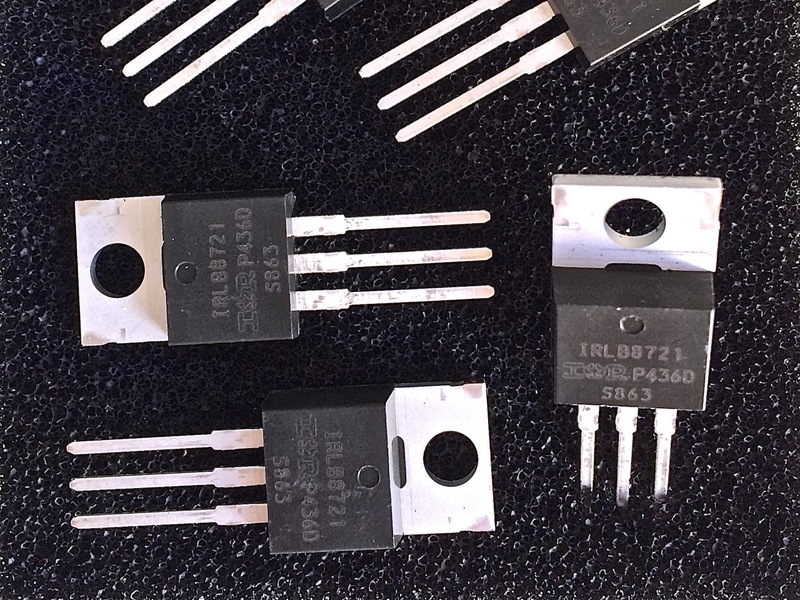 Skip that generation and go for an LDO linear regulator instead? Perhaps dive right in with the added complexities of a switch mode regulator? Or go all the way with an adjustable regulator, 7-segment displays to keep track of the voltage and current levels, and configurable presets for current and/or voltage limiting? Whichever type I pick, it seems like a good idea to at least stock up on some TO-220 heat sinks. Since I don’t know my exact needs yet, and I haven’t played around with heat sinks before, I decided to get a few different versions, ranging from 28C/W to 8.8C/W, along with a pile of appropriately sized bolts, nuts and washers, and a tube of thermal compound from a random brand. While the heat sinks on the right are pretty standard, the two on the left (both shown upside down because of the solderable tags) are more interesting to try out. The first one is a clip-on version, which doesn’t have a mounting hole. 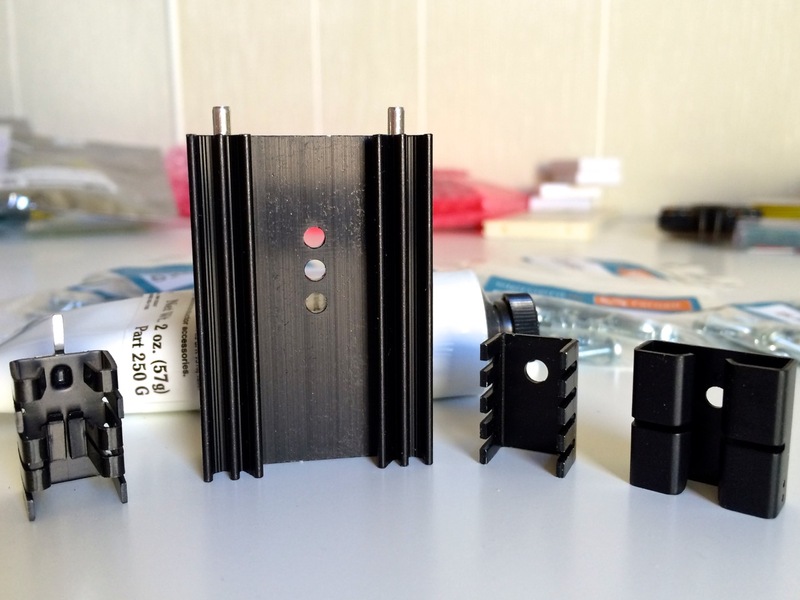 Instead, it applies a constant pressure over the entire contact surface area of the package with two clamps. The second one is quite massive, and should help me deal with any extreme heat dissipation requirements. 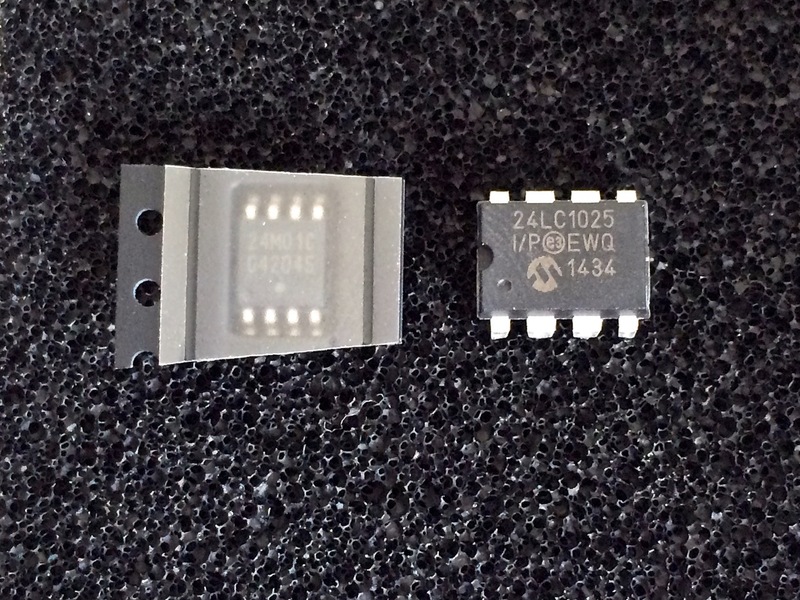 Speaking of upcoming projects, that’s where the purchase of these two I2C compatible Serial EEPROMs comes in. I’ve been collecting I2C EEPROMs of various brands and sizes, and these two are my latest additions. The ON Semi CAT24M01 on the left is going to be a nice challenge, considering it’s the first surface-mounted package I’ll attempt to work with. Even with my limited experience, it’s pretty clear I’ll have to move on from through-hole components to SMT at some point to keep up with the latest tech. I already have some nifty SOIC/SOP to DIP adapter boards lying around, but I’m afraid my current cheap soldering iron will turn any attempts at soldering the tiny leads into a horrible mess. I’ve already ordered a Hakko FX-888D, which was out of stock, but should get here in the next 10 days or so. Eventually I want to build my own reflow oven, but it’s probably best to take small steps instead of leaps, and get some more experience with hand soldering first. Since I’m still working on building up my stash of assorted basic components, I decided to get some MOSFETs as well, especially now that I get to pick an actual brand, instead of a random Chinese no-name company. 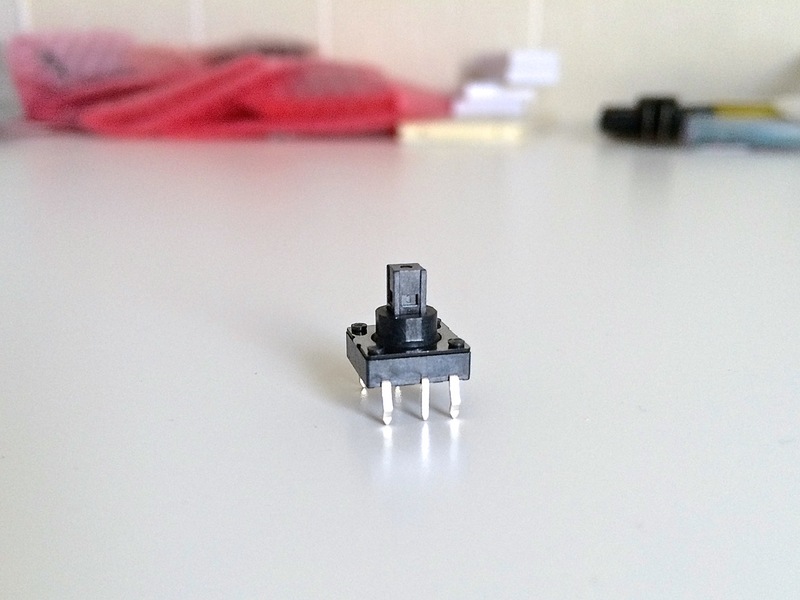 The IRLB8721 N-Channel MOSFET can handle 30V/62A, which should be more than sufficient for my projects. It has a very low Rds(on) keeping everything cool, although I do have that nice collection of heat sinks now, should the need arise. I haven’t come up with a good reason to stock P-Channel MOSFETs, but I should probably get a few at some point, just to have them available. Today’s final item is this neat little 5-way joystick, or rather, 4-way directional switch with a center push function. I only bought a single joystick, because they’re relatively expensive compared to regular switches. I want to try one out first before stocking up. I mainly needed one for my alarm clock project, allowing me to copy the interface of a typical old school mobile phone, with two side buttons and a joystick in between. Now I just need to find an appropriate switch cap, or perhaps design and 3D print one myself. That could be fun.